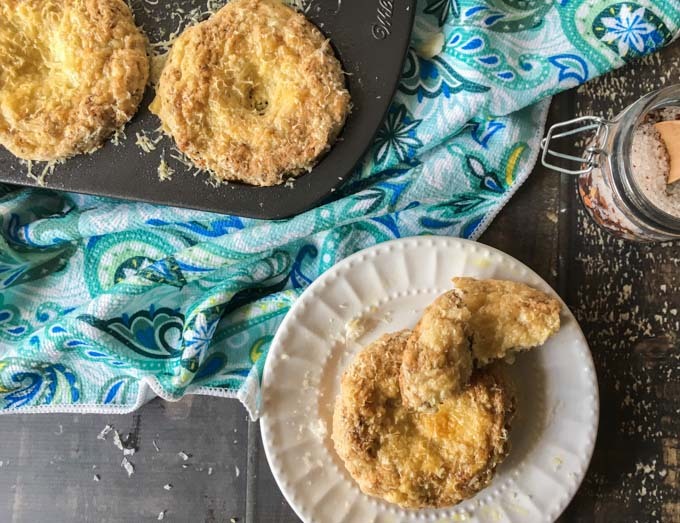 You can get your bread fix with these chewy, low carb Asiago bagels. Easy to make, gluten free and best of all each one is only 6.3g net carbs. They are also high in fiber (6.1g) and protein (13.7g) so it’s a healthy breakfast to start your day. My hubby and son love bagels. Even though I’m not a huge bread person, sometimes I get jealous of them slathering their bagels in cream cheese and butter. So I decided to take matters in my own hands and make this low carb Asiago bagels. I remember having them at Panera and loving this flavor and I’m so happy with the result. 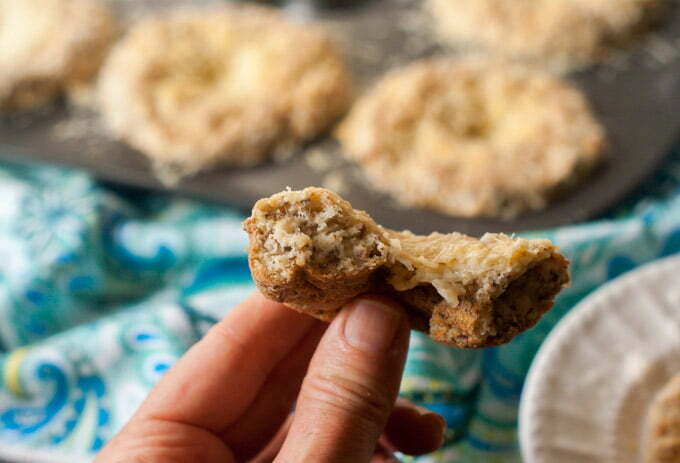 They are a chewy, tasty bagel that I can now slather with cream cheese and butter (because those two things are also low carb). Another thing I like about these bagels is that they are high in fiber (6.1g) and high in protein (13.7g) and lastly they are freezable so these make a very healthy, grab and go breakfast. I’ve made bagels on this blog before. I love my sun dried tomato & herb bagels as well as my Paleo blueberry ones. This one is more like the tomato & herb because I used psyllium husk powder. That is what gives it that chewy flavor that is essential in a good bagel. However if you don’t have any and want to try another flavor right away try the blueberry bagel and order the psyllium husk powder online. If you miss your bagels you will want to try this version. 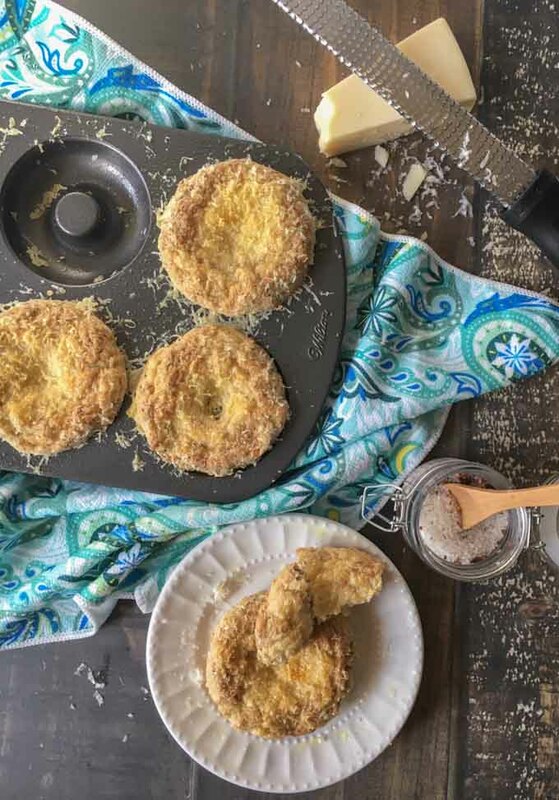 If you end up buying psyllium husk powder on Amazon, you might want to treat yourself to one of these non stick donut pans. 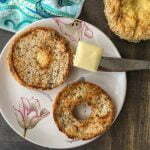 They are very convenient for making healthy donuts and bagels. These are the ones that I have and they work great. If you don’t have a donut pan, you will have to try to shape the dough into a donut shape. I’ve not done it so I’m not sure how it will go. I would bake them on a piece of parchment paper or silicone mat too if you are not using the donut pan. In a large bowl, mix the dry ingredients (almond flour, coconut flour, psyllium husk powder, Swerve, flax, salt, baking powder). Next add the vinegar, egg whites and boiling water and stir after adding each one. Add in half of the cheese and stir again. Mix until a sticky, spongy dough forms. Divide mixture into 6 portions and spread smoothly into donut pan. Top with the rest of the grated cheese on each. Bake for 25-30 minutes and check for doneness. Should be firm to the touch. 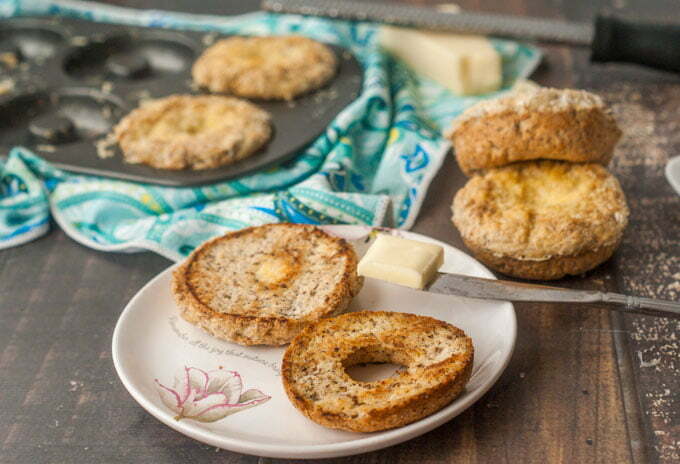 You can get your bread fix with these chewy, low carb Asiago bagels. Easy to make, gluten free and best of all each on is only 6.3g net carbs. Grease a donut pan and set aside. Next add the vinegar, egg whites and boiling water. Stir between each addition. Mix until a sticky, spongy dough forms. Add in half of the cheese and mix again. Divide mixture into 6 portions and spread smoothly into donut pan. Use your fingers to smooth them out a bit. Top with remaining cheese. Let cool completely before taking out of pan. Store in the refrigerator or freezerr. Can honey be used instead of swerve? Hi Jann, if you are watching carbs then you shouldn’t use honey because it’s carb content. You can use another sweetener or eliminate it altogether. If you don’t care about carbs, go ahead and try it. Hope that helps!